Without U.S. participation, the first-ever global-warming treaty was doomed to only partial success. Will Bali be better? 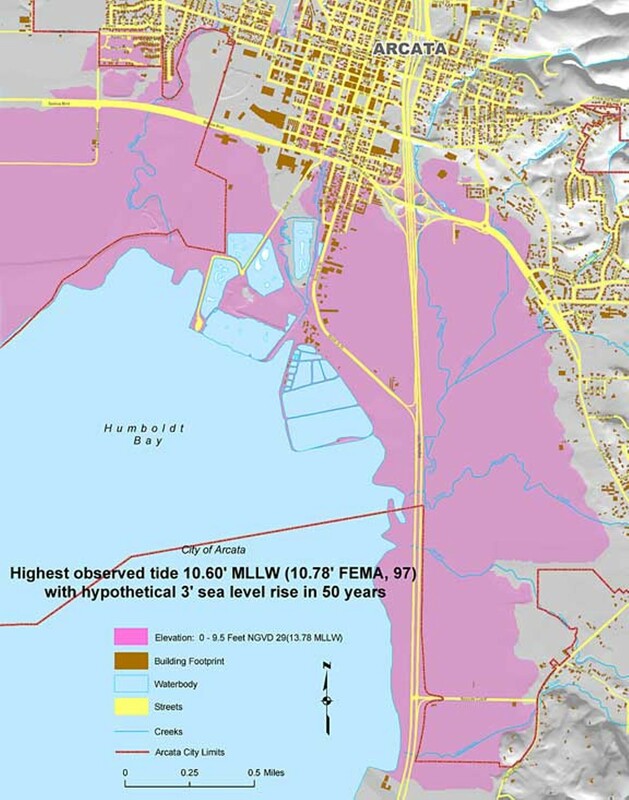 Arcata, Calif., highest observed tide 10.60 ft. MLLW (10.78 ft. FEMA, 97) with hypothetical 3 ft. sea level rise in 50 years. 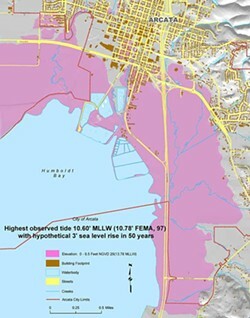 Map courtesy of the City of Arcata. Ten years. In geological time, 10 years is hardly noticed — a speck of dust. But for sentient beings, much happens in 10 years. Children grow up, parents and friends pass away, wars start and end, presidents are elected and disgraced, political parties rise and fall. In the last 10 years around 1.2 billion babies have been born. Some will live to see the 22nd century. Most will have children of their own. Ten years ago, the nations of the world gathered in Kyoto, Japan, to take action to prevent dangerous interference with the planet's climate. Many hoped that meaningful steps would be taken to protect the Earth for future generations. Ten years earlier, scientists working through the World Meteorological Society and the United Nations established the Intergovernmental Panel on Climate Change to assess the science of climate change. (The IPCC is the first 20-year-old to win a Nobel Prize.) By 1995, the IPCC concluded that there was a "discernible human impact on the climate." Banal as those words sound, their significance is overwhelming. They communicate awareness that our generation can irreversibly damage the Earth's ecosystems for future generations simply by the way we live. Slowing down and stopping climate change will require societal change on a scale never contemplated previously. The Kyoto Protocol was a first attempt by the nations of the world to bring about this vast change. Kyoto residents, dressed up as rabbits, ducks, trees and other fauna and flora, marched through the streets in well-choreographed demonstrations. Melting penguin ice sculptures were placed at the entrance to the newly built conference center. Banners and placards in Japanese and English filled the air. A big pink "CO2" wrapped in chains with a leaf growing out of the last link was ubiquitous. Then-Vice President Al Gore was a target of the creatively inclined. "Al Gore — Cut GHGs Now or Go Home" was a Japanese favorite. Some Aussies brandished a red banner with a bunsen burner burning the planet from down under. Greenpeace built a monstrous scrap-heap Tyrannosaurus Rex with a scorecard-style banner that read Dinosaur Diplomacy 1, Climate 0. A beautiful tapestry of a fierce Fudo Myoo, the Buddhist deity of fire, draped the sides of the Kyoto conference center. Inside, activists from a plethora of NGOs scurried around, sleepless, trying to figure out what was going on in the closed-door negotiations and incessantly writing press releases. Business trade organizations set up booths promoting their technologies. The nuclear industry was calling for a nuclear renaissance. Enron announced plans to build a 50 megawatt solar power plant in the Nevada desert. Toyota passed out refrigerator magnets touting its new hybrid-electric eco-car that it promised to bring to market soon. For the first seven days, the European Union and the United States haggled over how much greenhouse gases to cut and how much flexibility to provide in the treaty. Enviros complained the United States wanted so many loopholes — "flexibility mechanisms" to use the language of the diplomats — that the treaty would be toothless. On the eighth day, Gore flew in and told the U.S. delegation to compromise. Later, Gore symbolically signed the protocol on behalf of the United States. Gore, who stated in his 1992 book Earth in the Balance: Ecology and the Human Spirit that "we must make the rescue of the environment the central organizing principle for civilization," was an enigmatic figure for many attending the Kyoto conference. No political persona understood the issue of climate change better than Gore. Yet the Clinton-Gore administration risked little to move the public on an issue in which the Earth was in balance. Even before the Kyoto conference it was clear the Clinton-Gore administration would not fight for ratification of the treaty in the Senate. It may have been a question of timing. Seven years later the treaty became international law, ratified by 169 countries. Among developed nations, only the United States and Australia have been AWOL. (Though following a change in government, Australia signed the treaty this week.) A core principle of the treaty is that the nations of the world have "common but differentiated responsibilities" in controlling greenhouse-gas emissions. That phrase is an acknowledgment that the developed countries of the world are responsible for most of the damaging emissions in the atmosphere and need to take the first steps to reduce emissions. Developing countries, like India and China, are not required to meet specific emission targets during the first compliance period (2008-12). The Bush administration has argued that the United States should not be compelled to reduce greenhouse-gas emissions since China is not required to do so. And although the United States never officially withdrew from the Kyoto Protocol, the treaty was never sent to the Senate for ratification. From 1990 to 2005, U.S. emissions have increased by 16.3 percent. The Kyoto Protocol requires a U.S. reduction 7 percent below 1990 levels. Among European nations, only the United Kingdom and Sweden now are achieving real reductions in greenhouse gases. The most significant emissions reductions in the last 10 years have come from the collapse of industrial enterprises in the former Soviet Union and Eastern Europe. Looking back 10 years, it would be easy to argue that the Kyoto Protocol has been a failure. Without U.S. participation, it was doomed, at best, to only partial success. However, during the past 10 years the awareness of the impact of climate change and the impetus for strong action has grown. Devastating hurricanes, fierce wildfires, prolonged droughts and cataclysmic flooding have defined what is at stake. The consequence of inaction for the lives of those born in the last decade and their children is now obvious. The significance of Kyoto, beyond the details, is that there is now a viable international legal framework for dealing with climate change. This week, the nations of the world came together in Bali, Indonesia, to start negotiating for a post-2012 climate plan. What happens in Bali will set the stage for the next U.S. administration. It is hard to imagine that the United States will not want to re-engage the rest of the world on an agreement that is crucial for the health of the planet and future generations. The magnitude of what needs to be done to stabilize the planet's climate can hardly be understated. We must transform the ways we produce electricity, heat our homes, power our factories and transport ourselves. We need to cut the use of fossil fuels by at least 50 percent, and maybe more, by 2050. We don't have any time to lose. Ed Smeloff has 20-plus years of expertise in energy policy and resource planning. He now works as a senior manager for project development at Sharp Solar Energy Solutions Group in Southern California. Ed Smeloff has 20-plus years of expertise in energy policy and resource planning. He works as a senior manager for project development at Sharp Solar Energy Solutions Group in Southern California.